Snail slime has been elevated from the garden, and is now being claimed as the new miracle face-fixer in the U.S. While creams containing snail slime have been popular in Korea and Africa for a few years, brands such as Missha, Dr. Jart+ and Labcconte have begun to bring them Stateside. Primarily marketed as an acne solution, the shelled slug’s mucus is also believed to reduce pigmentation and scarring, as well as beat wrinkles. Snail slime-based beauty products have been used sporadically since the Ancient Greeks recognized its potential, with Hippocrates reportedly recommending crushed snails to relieve inflamed skin. However, the beauty potential of snail slime was rediscovered by chance recently, when Chilean snail farmers noticed their skin healed quickly, with no scars, when they handled snails for the French food market. Those same farmers went on to launch Chilean snail slime product, Elicina, which last year enjoyed its 15th anniversary. Korean brand Missha then launched Super Aqua Cell Renew Snail Cream in 2010, claiming that its 70% snail extract “soothes, regenerates and heals skin”. Another Korean brand, It’s Skin, manufactures Prestige Cream d’escargot, which contains 21% snail slime. 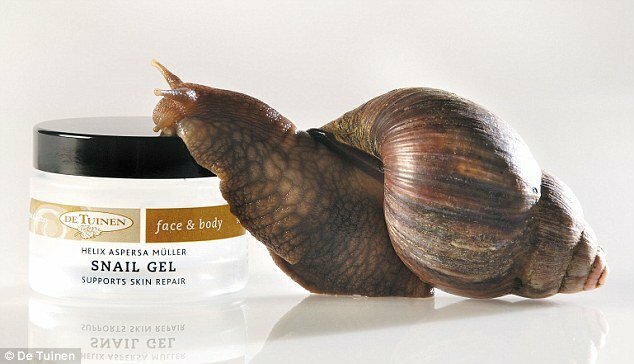 According to Fashionista, snail creams are found in everything from face wash to shampoo in Côte d’Ivoire local supermarkets, and now it has been popping up in products in the U.S.
Snail slime – or, technically, Helix Aspersa Müller Glycoconjugates – is a complex mix of proteins, glycolic acids and elastin that nature developed as a way to protect snail skin from damage of rocks, twigs, and other rough surfaces; infection, and UV rays. However, some dermatologists are still unsure.